To visit the church's web site, click on the picture above. 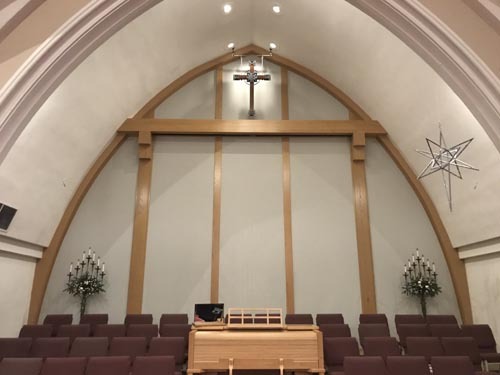 College Hill Presbyterian Church required a total redesign for their sound and presntation systems. This beautiful sanctuary is built in the traditional trancept shape resulting in difficult design parameters to allow for all worshipers to hear and see adequately. Additionally there is a small balcony in the rear of the Nave which requires special attention for good audio distribution. the main mixing console is located in the balcony adding additional impetus for good design to cover that area. An older point source speaker system was removed and replaced with a high quality Renkus-Heinz point source system. The Nave is covered with two cabinets. The main cabinet covers the rear portion of the main seating area and a front fill cabinet containing only a high frequency horn covers the front seats. The north trancept also presented a unique design challenge. At some point in time the North Trancept seating was extended but the upper portion of the wall was left closed in making it impossible to reach the far listeners from the main speaker location. The near seats are covered using a Renkus-Heinz cabinet located in the center location. A second speaker is installed on the rear side of the dividing wall to cover the extreme far seats. Balcony coverage from the central cluster was inadequate due to the distance and the height of the listener in relation to the front speaker. A wide angle Renkus-Heinz speaker was used for fill. The processor was set to the proper delay time. 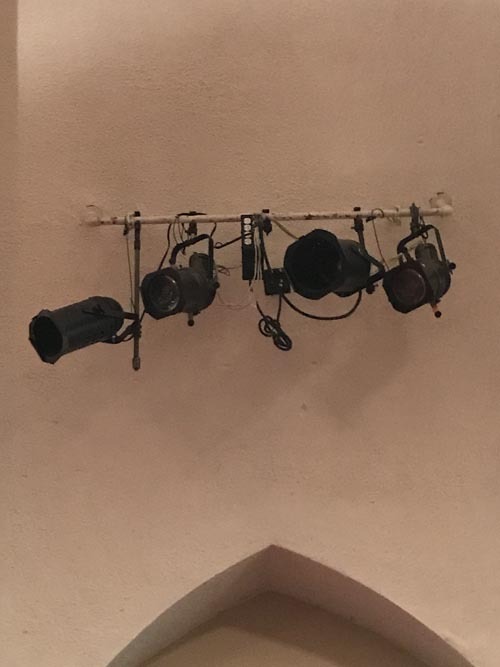 A small speaker mounted in the Narthex directly below the balcony was also connected to the same delayed signal. At the rear of the chancel there is a grille covering the pipes of the mangificent Schantz organ. In an effort to retain consistancy of architecture and still provide proper viewing angles, a special custom wood structure was built to house the motorized and acoustically transparent video screen. Remote switching allows the screen to be reised and lowered as needed. 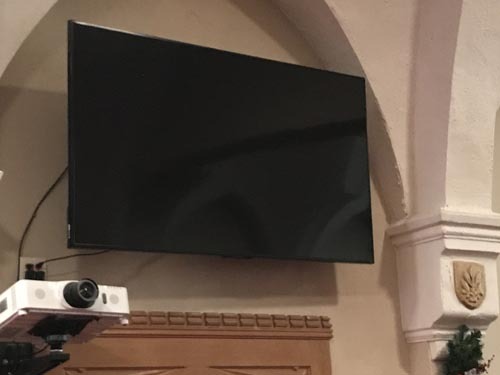 80" confidence video monitors were added for the choir. Shown here is the video presentation control center. 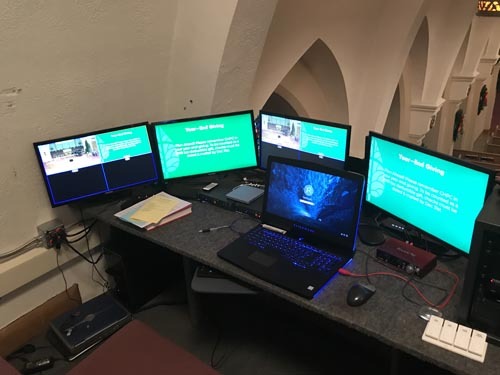 Two computers are in use, one to provide the image for the main screen in the Sanctuary and a second computer to provide images for the signage screens located throughout the building. The screen on the left shows each of the available inputs: Computer 1, Computer 2, Camera and DVD player. 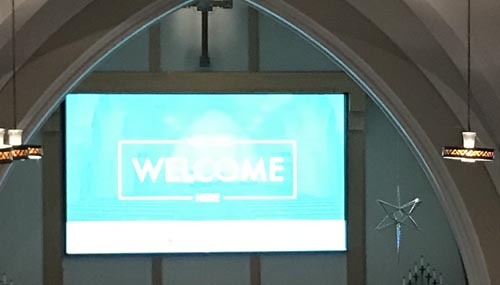 All inputs are available to both systems so that any of the inputs can be used in iether the Sanctuary or on the displays elsewhere in the building. 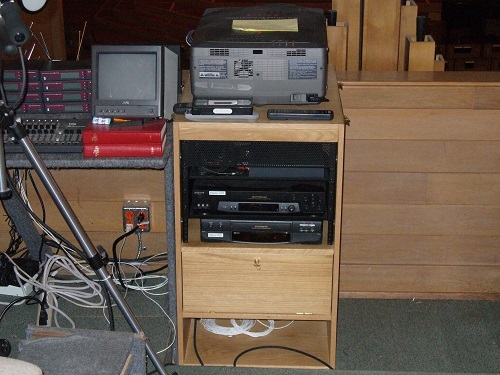 During the services audio is added into the video stream so the remote displays can carry the service. During the week the remote displays can carry announcements or other media as needed. A custom stand was added to the balcony to house the projector for the main screen as well as video recording units. 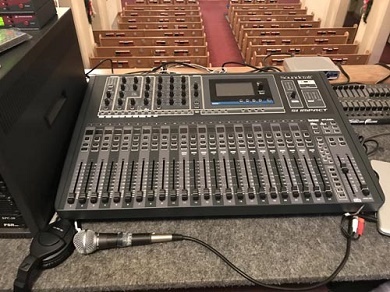 A Soundcraft Si Impact digital console provide the audio engineer with the needed tools to provide quality reproduction to the audience. The speaker processor and power amps are housed in a dedicated closet in the front of the building. Active ventillation was added to provide adequate air flow to keep the units cool. A pair of matching light bars are installed, one in either Trancept, to provide adequate lighting for the services. A dimming controller is located in the tech control booth. Copyright © 2004-2019 Sound Concepts LLC. All Rights Reserved.